Outside the University of Utah Hospital windows a blizzard swirled, inside another kind of power, not the least bit natural, was about to be set in motion. 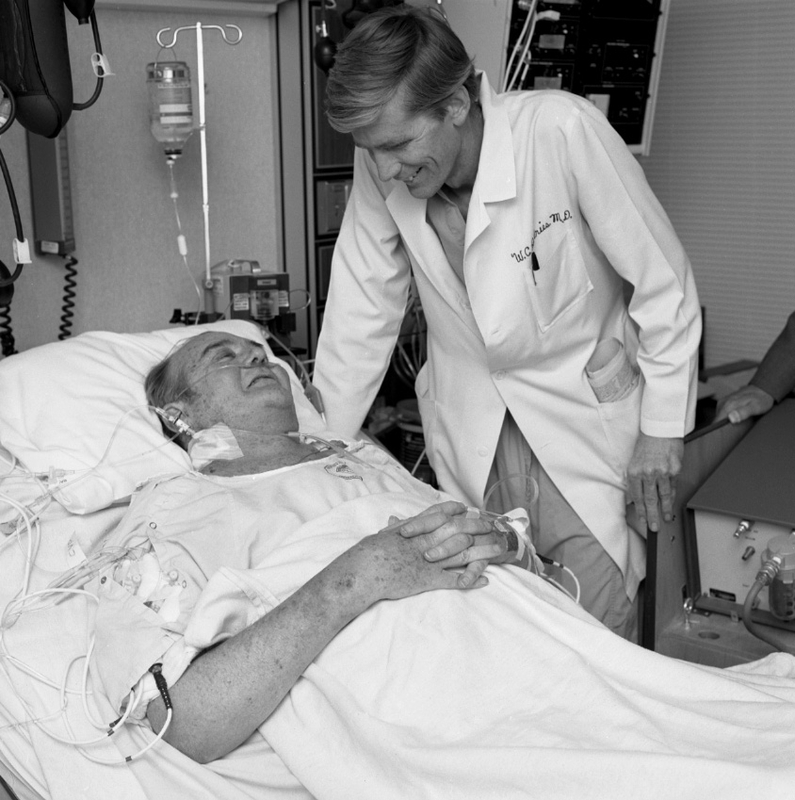 Thirty years ago on Dec. 2, 1982, in the darkest hours of the morning, cardiothoracic surgeon William DeVries, MD, carefully removed the ravaged heart of Dr. Barney Clark—a heart that tore like tissue paper due to years of treatment with steroids—and replaced it with the world’s first permanent artificial heart. Known as the Jarvik-7 (named after former U of U physician and inventor Robert Jarvik, MD), this aluminum and polyurethane device was connected to a 400-pound air compressor that would accompany Clark for the rest of his life - all 112 days of it. At the time, such a move was associated with the significance of putting a man on the moon or seeing Saturn’s rings for the first time. It captivated the world. Others equated it with Frankenstein-like aspects, raising bioethical questions and concerns. During the seven-hour operation, reporters from around the world set up their press headquarters in the hospital cafeteria, draining the coffee supply. The entire world held their breath, as Clark began his final journey, pioneering a new frontier of medicine involving the most symbolic of all our organs, the heart. A dentist and “tough old guy” from Seattle, Clark was hailed as a hero as the world witnessed him weathering hard days and enjoying some good ones too. Celebrating his 39th anniversary with his wife, Una Loy, and their children was one of the good days. Today, researchers at the University of Utah continue to push the boundaries of what’s possible for patients like Barney Clark. “Our Advanced Heart Failure program remains the only institution in the region actively studying novel, investigational devices to support the failing heart,” says Craig H. Selzman, MD, surgical director of the University of Utah’s Cardiac Mechanical Support and Heart Transplant program and the Lung and Heart/Lung Transplant program. During the Barney Clark era, the field was so young (the U barely had a heart surgery program), that transformative leaps such as implanting the first artificial heart could be made. Today, research in this field is more about incremental advances, smaller steps forward. “What we are trying to do now, just like all of medicine, is to become more biologically based,” explains Selzman. “Engineering is important, but the devices we use are now very refined.” Today, patients suffering from heart failure can extend their lives with the implantation of a left ventricular assist device (LVAD) that weighs only ten ounces and has a diameter of 2.5 inches. Did you believe the Jarvik-7 heart would work? I absolutely believed that the implantation was going to work; otherwise I would not have done it. I was confident in the device, and I knew that if I were in Barney’s shoes, I’d have done it. As a matter of fact, the original Utah Artificial Heart [Jarvik-7] is almost exactly the same as the Total Artificial Heart being used today. I had personally already implanted about 200 artificial hearts in calves and they did really well. Plus, we had a strong team at the University of Utah. How was success defined? According to the Utah IRB [Institutional Review Board], success was defined as Clark coming out of surgery alive. That shocked me. My idea of success was to give Barney some quality of life, get him up and moving around, and living a bit longer. Why Barney Clark? We had spent quite a while looking for the right patient and Barney fit the criteria for the kind of patient we were looking for. He was over 50, had chronic heart disease, and had no other options available for him. The other systems in his body were working moderately well, and he had a strong support system, primarily his family. By the time I saw him, he was facing the last few weeks of his life and death was imminent. When you first approached Clark, he declined. Why was that? Barney was a tough old guy, and as a successful dentist knew something about medicine. I had him watch me put an artificial heart into a cow. He saw the cow wake up and walk around. I really wanted him to understand what he might be signing up for. Barney said ‘I have some problems that this cow doesn’t have—it’s healthy going into this, I’m not.” He decided not to go through with it. I admit, I was a bit disappointed but accepted his decision. What changed his mind? He changed his mind on Thanksgiving. He was so sick that day that his son had to carry him to the head of the dinner table. Going to bed that night, he told his wife, he was going to go through with it. He explained to her, “I’ve been kept alive for the last four years through all kinds of medicine and therapies that other people have given their lives to inform me; now, it is my time to pay them back.” That comment has really stayed with me, especially as I went on to help other patients whose reasons for the operation were different. Barney’s reason was to contribute, to move science forward and to help others in the future. Once he made up his mind, he was quite determined to go through with it. What was Barney’s reaction when he awoke from the surgery? When he woke up and started looking around, I asked Barney, ‘how do you feel, do you have any pain?’ He said ‘no pain’ but that he was aware of a strong heart beat in his body for the first time in a long time. Then he looked at his wife, Una Loy, and said, “I want to tell you even though I have no heart, I still love you.” He really became a hero for everyone, including the 350 reporters who were camped out in the hospital cafeteria that night and there every day that Barney was alive. What was the last day like? On that 112th day— the entire period in which I had only left the hospital once—I had just checked on Barney and he was up reading the newspaper. An hour later, he was unconscious and his blood pressure had plummeted down to zero. At that time, declaring death was based on one’s heart stopping not on whether one was brain dead. His wife was with him, when we agreed to turn off the heart-pump machine. It was over. The easiest thing for Barney to do would have been to go home and die, but he chose not to; he was a pioneer who truly did give his life for something important. What did you learn from the experience? We did a lot of trouble shooting over those 112 days. We’d never had a person on this device before, so we faced a lot of new issues ranging from dealing with anti-coagulation measures to how best to deter infection. We worried about whether he should be on antibiotics the whole time. The hospital really rallied around us and we had these huge, collaborative meetings with people representing specialties from throughout the U, all helping us decide how best to care for Barney. In the end, we probably treated him with too many antibiotics and he got an infection—Pseudomembranous Colitis. What was the most valuable result? The favorableness for this type of new technology jumped. If it had not worked, it may very well have slowed down the progression in this area. Instead, within the next ten years, 236 Utah Artificial Heart implants had been implanted around the world. Today, artificial implants [LVADs] are being used primarily as a bridge to transplants—securing people time until a heart is available. What did this mean for you personally? That whole experience really defined my life and career. I’ve learned, above all, that the patient is the most important person and that relationship needs to be the focus. That was a key lesson for me as a doctor; developing a strong communication bond with the patient was a source to key information and more likely meant success. This meant that spending time with my patients, really listening, and reciprocating with openness and honestly was key. With all the eyes of the world looking at me in 1982, I was very glad to have someone like Barney Clark and his wife in my corner. He really did give his life to thousands of people. All medicine is like that—it came from someone who dared to do something like this.